Before the dawn of cows, people ate goat cheese. This cheese has stood the test of time, though has lost its throne as number one cheese source to cow dairy. Nevertheless, there is something still attractive about goat cheese, with its enveloping, tart flavour that lets us experience dairy in a new light. 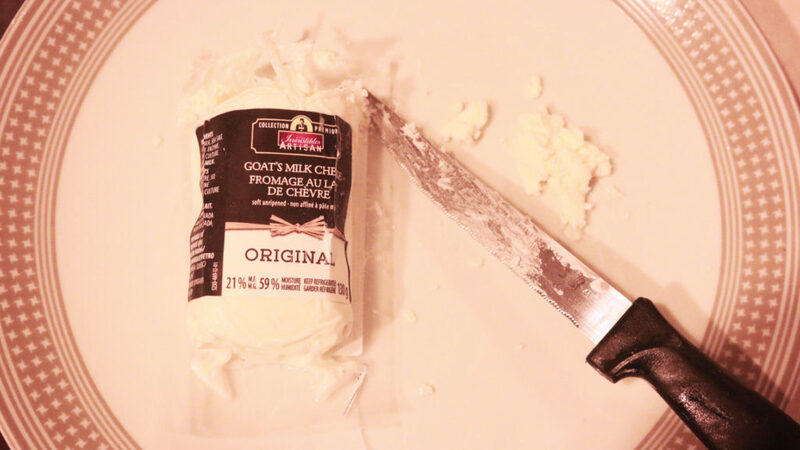 Goat cheese is like the under appreciated, fun uncle-who's-seen-a-lot-more-than-your-dad-and-tells-better-stories of cheeses. Familiar, but different. In a good way. Back when A&P Grocers were still around in Ontario, the business's “Master Choice” brand was introduced, which featured premium quality food items made in Canada. One such product was their Master Choice Goat Cheese. After A&P morphed into what is now known as Metro, “Master Choice” took on the name “Irresistables,” giving us a new series of, perhaps, overconfident grocery products. This 59% moisture cheese is grocery-level cheese of course, but it is nevertheless a good purchase, especially if you're only using your cheese as an ingredient in a larger meal. The soft, spongy texture feels rich and appetizing, and goes well on sandwiches and crackers. The mouthfeel is equally rich, but the novelty of the taste wears off quickly. This is a cheese that is best enjoyed in small quantities lest you lost the tang and start to experience the cardboard-like undertones. Irresistables Artesian Goat Cheese is a good cheese for its value, and you could certainly do worse with a grocery-brand cheese. Go get the goat!